Perched on a plateau overlooking Los Alamos, the Quemazon community is one of the most desirable places to live. Custom built homes are among the majority, but options for living in Quemazon include everything from apartments to townhouses to single family homes. The purpose of the Quemazon development is to create a community of high-quality development in which the natural character of the area is preserved and complimented. The secluded setting of Quemazon combines mountains and mesas for a peaceful setting. Trails such as the Western Perimeter and Pipeline are accessed from different points in the neighborhood and afford outdoor enthusiasts opportunities to explore the region. Click here to go to Quemazon website. View Quemazon Homes for Sale! The Barranca Mesa and North Mesa communities neighbor each other in beautiful Los Alamos. The Barranca Mesa community was founded on a unique history beginning in 1958. A lottery awarded 68 residents the first round of privately held lots in Los Alamos. Homes in Barranca Mesa consist mostly of single family homes with styles ranging from ranch homes on large, sweeping lots to homes placed with stunning views on the canyon rim. If hitting the trails is a favorite pastime, you will enjoy that the Bayo Canyon, Pajarito, Western Perimeter, Rendija Canyon, Otowi Mesa and Deertrap Mesa trails are all accessed from this great community. Just up the road, the North Mesa community is slightly newer having been founded in 1976. Planned developments of Loma Vista, Hawks Landing and Broadview are all located on North Mesa. There are a wide variety of home styles including the favorite canyon rim properties that grant magnificent views that are what make many want to call New Mexico “home.” Another great feature of the North Mesa community are the large, activity-driven spaces that are speckled throughout with ball fields, rodeo grounds, stables and forested picnic ground. Accessed through this neighborhood are the Bayo Canyon, Walnut Canyon, and Kwage Mesa trails that offer an array of unique hiking experiences. View Barranca Mesa and North Mesa Homes for Sale! 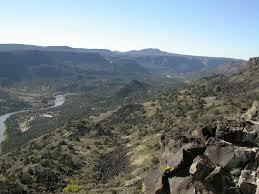 Located in the portion of Los Alamos County known as White Rock are the communities of Pajarito Acres and La Senda. The Sangre de Cristo and Jemez mountains provide a beautiful backdrop to these neighboring areas and set a tone that is truly peaceful and natural. Both Pajarito Acres and La Senda have been zoned rural and therefore allow animals to be housed on the properties. Although the setting can cause you to feel as though you have stepped back in time to a simpler time, a suburban lifestyle is still present. Homes are situated on two to three acre lots that provide ample room to have a barn or stable along with space for livestock or horses to roam freely. Nearby is the Pajarito Riding Club that offers members the opportunity to enjoy the open trails that offer views of the breathtaking Rio Grande River Canyon. Associations are present in both communities and are set-up to ensure that the quality of life and character are maintained. Every household is considered in the association and must adhere to the covenants set in place. If a well-maintained, rural setting is what you desire Pajarito Acres or La Senda might be the ideal place to find a home! View Pajarito Acres and La Senda Homes for Sale! The neighborhood of White Rock, which locals refer to as “The 672,” has an interesting history. Built in 1949 as a site to house construction workers, the area was never meant to be permanently residential. Consequently, when the employers left in 1957, the White Rock Construction Camp became a ghost town. Prefabricated homes and trailers were left standing and remained untouched for a few years. In the early 1960’s, when the nearby community of Pajarito Acres began to be developed, the construction camp at White Rock was torn down and new, single-family homes began to sprinkle the area. While the neighborhoods of Pajarito and La Senda were distinctly rural in nature, White Rock held a more suburban-type setting. Various home options are offered that suit any needs or lifestyles including single family homes, apartments and townhouses. Children in White Rock attend Chamisa grade school until middle school when they are transferred to Los Alamos. White Rock is a great place for those who enjoy going to the park because it is home to Overlook Park, which is the largest park in the county. There are also many trails accessed in White Rock such as Red Dot, Blue Dot, White Rock Canyon Rim, Canada del Buey and the Portrillo Canyon trails. View White Rock Homes for Sale!